Fourth Row Center: Film Writings by Jason Bailey: On DVD: "Before & After Stonewall: 25th Anniversary Edition"
On DVD: "Before & After Stonewall: 25th Anniversary Edition"
Titles notwithstanding, the documentary films Before Stonewall and After Stonewall aren’t actually about the Stonewall riots in June of 1969 that marked the birth of the gay liberation movement. Both begin with arbitrary mentions, but Before Stonewall doesn’t return to the seminal event until 81 minutes into its 87 minute running time (and then it spends about a minute); After Stonewall doesn’t dwell either. 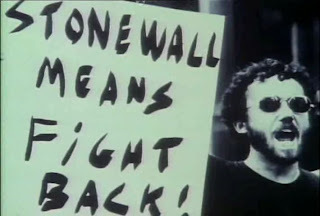 There are other films (like the recent, and terrific, Stonewall Uprising) that delve into the logistics and specifics of that event, but these are focused on how the gay movement arrived at that point, and where it went from there. These are perhaps the most literally-titled films imaginable. 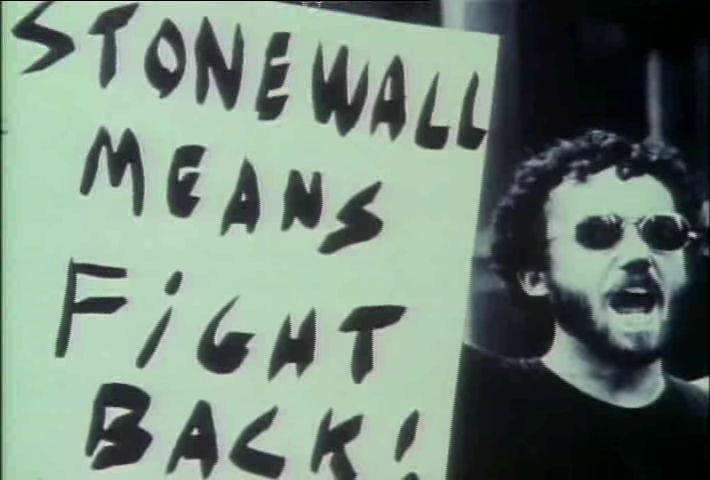 Before Stonewall, directed by Greta Schiller and Robert Rosenberg, goes back to the turn of the 20th century, using subtext-heavy old movie clips (much like The Celluloid Closet), loaded candid photos, newsreel footage, and vintage songs to supplement the historical perspectives and personal recollections of the interview subjects, some of them artists and activists, most regular folks. Their first-person narratives, and the history that they relate, are fascinating, and the filmmakers hit the expected beats (WWII, McCarthyism, civil rights, hippies) but from the perspective of gay Americans—how those historical turning points affected their specific struggle. That history is accompanied by the early pangs of the gay rights movement: the formation of the Mattachine Society and the Daughters of Bilitis , the inspiration provided by the civil rights and women’s rights fights, the tiptoeing out into the open with early demonstrations, the men in suits, the women in dresses and nylons. Through the memories of those who lived through the era, the film paints a vivid picture of tentative gay life—how homosexuals sought out camaraderie while staying safe, how the legal victory of Ginsberg’s “Howl” changed the availability and accessibility of gay-themed written works, how San Francisco and New York (specifically Greenwich Village, home of the Stonewall) became destinations for isolated gay people seeking out like minds. The film’s only real stumble is in the flat, uninspired, academic (and, frankly, wholly unnecessary) narration. But they pack a lot of history into the informative and exhaustive Before Stonewall, while keeping it fast-paced and entertaining; same goes for its follow-up, After Stonewall, which covers 30 years (from the uprising in 1969 to the film’s broadcast in 1999) beginning with the various organizations that popped up in the years immediately following the Stonewall riots and following the movement through the ups and downs of the 1970s, 1980s, and 1990s—the victories (the elections of the first openly gay politicians, the voting down of early anti-gay legislations), the losses (the assassinations of Milk and Moscone, the rising tide of homophobic sentiment), the villains (Anita Bryant, John Briggs, Jerry Falwell, Jesse Helms, and good ol’ Ronald Reagan), and the devastation of AIDS. Director John Scagliotti pulls from a deep well of terrific archival footage (check out Bette singing at the bathhouse!) and assembles a number of notable and engaging interview subjects, including Congressman Barney Frank, activist Larry Kramer, lobbyist Hilary Rosen, and writers Craig Lucas, Armistead Maupin, and Rita Mae Brown. As the narrative winds into the late 1980s, it morphs into an in-depth and compelling examination of the “culture wars”—the push for AIDS treatment and support, the formation of ACT UP and other activism and advocacy groups, the National Endowment for the Arts controversy, the disappointments of the Clinton administration (specifically Don’t Ask Don’t Tell and the Defense of Marriage Act), and the (still raging) fight over gay marriage. The film ends rather weakly, on a kind of inconclusive, “where we’re at” note, but it is a strong and informative doc nonetheless. Before Stonewall and After Stonewall are smart, well-crafted documentaries, though it does seem strange that both films have so little to say about the Stonewall uprising itself. But taken together, they paint a rich, full, and detailed portrait of the gay movement in the 20th century. "Before Stonewall" and "After Stonewall" are now available together in a "25th Anniversary Edition". For full A/V and bonus feature details, read this review on DVD Talk. Saturday Night at the Movies: "Inland Empire"